The e-Diary, which was developed by bangalore based Hi-Tech Solutions helps save, retrieve and transform every word, idea, sketch or anything else which you note on a paper. 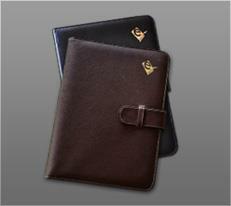 It is very compact and can be easily carried along which is a relief from carrying large laptops. The e-Diary was specially designed for hand written notes, which could later be converted into text using the handwriting recognition software. It comes with a price tag of Rs. 9350. You can save your child's work/sketches and improve their creativity. Students can save their notes using the date option and transform it to text or .jpeg files and print them. You can personalize your messages and transmit them immediately. Professionals can save meeting notes and set reminders. Doctors can record prescriptions and maintain patient history. It also has an e-prescription recorder. Homemakers can write, store and mail in their mother language, save and share recipes and search phone numbers using the search feature. It is a very productive tool for Architects, Lawyers, CAs etc. The eDiary package has a base receiver unit, an electronic pen, an A5 size paper notebook, an installation CD, a USB cable, two LR 41/SR 41 batteries and an ink refill. Power LED:It blinks slowly in standby mode and blinks quickly when writing. Battery Status LED:It blinks slowly during charging or when the battery is very low. It glows steadily once the battery is fully charged. Bluetooth LED:It blinks slowly when the Bluetooth is on. If the 3 LED's blink continuously, it means that the notes are saved successfully. The e-Diary has a USB interface and a Bluetooth button. Initially, the battery must be charged at least for 3 hours. Connect the eDiary to the laptop using the USB cable to charge. Rotate anti clockwise to remove the compartment of the battery. Insert the 2 batteries. Close the battery compartment. To insert a new refill, slide the refill, insert it on top of the pen and gently press. To extract the refill, use the extractor which is placed at the top of the pen cap and insert the refill. Push, rotate and pull it. You can also use an external extractor to remove the refill. Insert the installation CD provided in the package to install the software and then follow the instructions. Once successfully installed, an e-Diary shortcut appears on the desktop. It can also be reset using the reset hole available at the top of the e-Diary. Open the e-Diary and check the indicative blinking on the base unit. It indicates that the gadget is ready to use. Begin writing using the digital pen attached to the diary. While writing the indicator starts blinking faster. It means that all the notes are being received by the base unit. To save the data, raise the base unit. Notice all the indicators blinking fast showing that the data is being saved. Close the e-diary once you finish writing. It will save all the data and turn off automatically. Connect the e-diary to the PC using the USB cable or Bluetooth. To connect using Bluetooth, turn on the Bluetooth button on the base unit and the PC. If the Bluetooth on the PC is not compatible or if the PC doesn't have Bluetooth, use the Bluetooth dongle. Click on the e-diary icon to run the software and wait for a few seconds so that the application detects the diary. The green lights at the bottom left corner indicates that the application and the gadget is connected. Click on the download option. All the notes from the diary will be displayed in the application. The installation CD contains the application that needs to be used in mobiles. Depending on the operating system on the mobile phone, choose the appropriate application from the CD and transfer it to your mobile through USB or Bluetooth. Install the application after which the e-diary icon appears on the screen of the mobile phone. Activate Bluetooth on the mobile. Once connected select the download option and click on the downloaded file to display it. Select the appropriate file and select "Send mail" or "Send using MMS" option. You can connect your mobile phone to the e-Diary to reflect what you write on the diary on to the screen. For this, click on the e-Diary icon and then select the Pen mode. Once the connection is established, begin writing with the pen. The online writing icon allows you to reflect what you write on to the PC. Once you have downloaded the notes from the e-Diary to the PC, several operations can be done using the application. Use the File menu option to open, save, download, erase, print, export etc. The e-Diary also allows to save all the downloaded data in the repository or a single file at any location. Go to File, click on Save as option and then choose repository after which a pop up window appears. Enter the title an click on save. Unsaved data appears on the current window. To save as an individual file, click on save as and then choose physical file. Enter the desired location, file name and save. Click on the search icon or use the find option in the edit menu. To enable the search in an e-Diary, you can use keywords or file names. It highlights all the words with the keyword and its occurrence in the file. The advanced search option also allows to refine the search using dates. It can track handwritten notes. Select a specific word on part of the document. It is possible to move, cut, delete or copy using the right click short cut menu of the application in the eDiary. Using the ink properties on the shortcut menu, you can change the color of the selected text. Select a page or note, right click and select send as email. From the short cut menu, email the doc. To merge 2 pages, select a page, right click to display the shortcut menu. Select Merge with option and enter the file to be merged in the window. Similarly multiple pages can be merged. You can convert your hand written notes to text using handwriting recognition software. It depends on the handwriting. For better results, write legibly and give proper spacing between the words. The Hi-Tech e-Diary is definitely a useful gadget for all. There is no age barrier here. It is not complicated to use and is very handy. The pen buttons which can also act as mouse buttons, once connected through the USB just proves its flexibility. This innovative product by Hi-Tech truly deserves all the attention it is getting. We tested the device in our review center and it performs pretty well. It had 98% success rate in recognizing hand writing of our reviewers. We found it overall a very useful product for executives who like to take down a lot of notes from the business meetings and convert to digital text. Watch the official video to learn more about the e-Diary. Minimum of 50MB of available hard disk space. Minimum of 256MB RAM. 512 MB is recommended. Go to the eDiary product page to get more technical specifications. You can get more details from the eDiary Website. For all those android users who are upset with the fact that Android does not have an artificial agent like Apple's Siri. Top 5 alternatives to Siri for android users has been listed here along with their popularity and number of downloads.